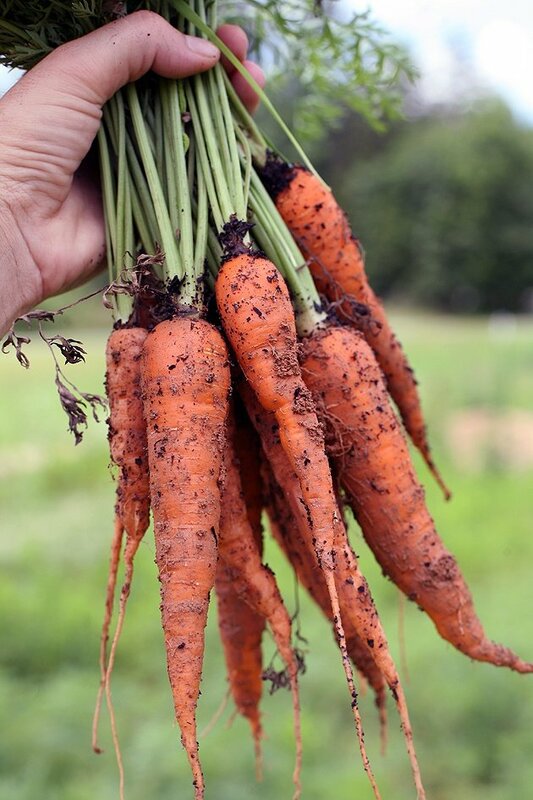 In this post, I’ll share with you 17 of my favorite vegetable varieties to grow in a kid friendly vegetable garden. These vegetables are small, colorful, tasty, and fun to grow. I find that the kids really love having their own space where they are responsible for everything that is growing, where they can dig where they want to, plant how they want to, and picnic and play. During the growing season, we spend most of our time outdoors. I spend a lot of my time in the garden and the kids are always around too. They love running between the rows, digging in the soil, planting, picking and so on. I love that they love gardening. I love that they make it a mini world and play games there. I used to think about the garden only from the food production point of view. The main focus for me was to grow as much as I could in the space. It’s still the main focus, but after years of observing the kids, I now have the desire to make it pretty and fun in addition to it being productive. I want to create a place where they can let their imagination go wild and their hands get dirty. And while they are at it, let’s make sure they have enough to keep their bellies full! 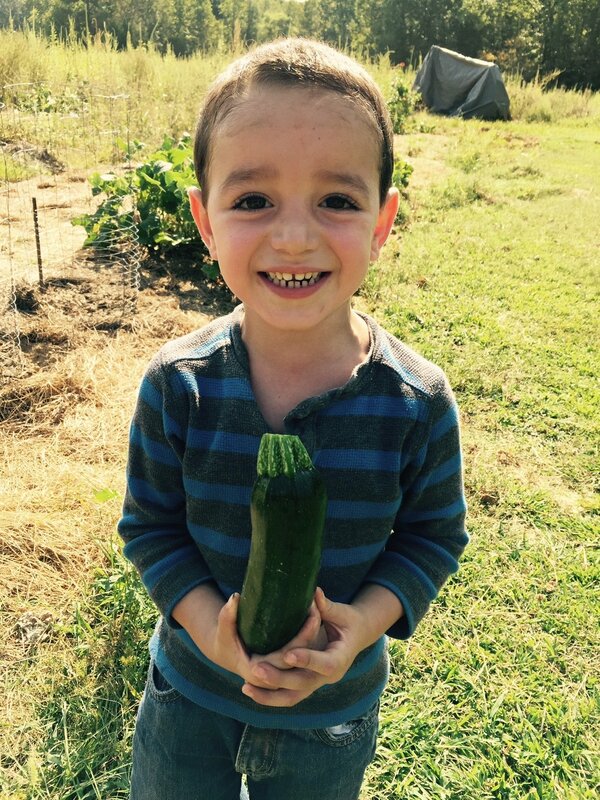 But let’s be honest here for a second… If you have young kids you know that gardening with kids when you actually want to produce food is not always easy. My kids are getting older now so I can incorporate the main garden with the kids garden and this makes it easy for me but I have to admit that when they were all under 5 years old I had more than a few garden meltdowns. There were times when my three year old decided to dig at that spot where I just spent three hours working the soil, spreading manure, pulling weeds, and planting new tomato transplants that I spent 8 weeks babying. Did I mention he stomped on, crushed, and killed the transplants? Maybe it’s just me and my temper, God knows I have a lot to learn about being patient, but there were a few times I wanted to strangle the kid. In his eyes, though, he didn’t do anything wrong, he was just working in the garden, being a good helper like everyone always wants him to be. 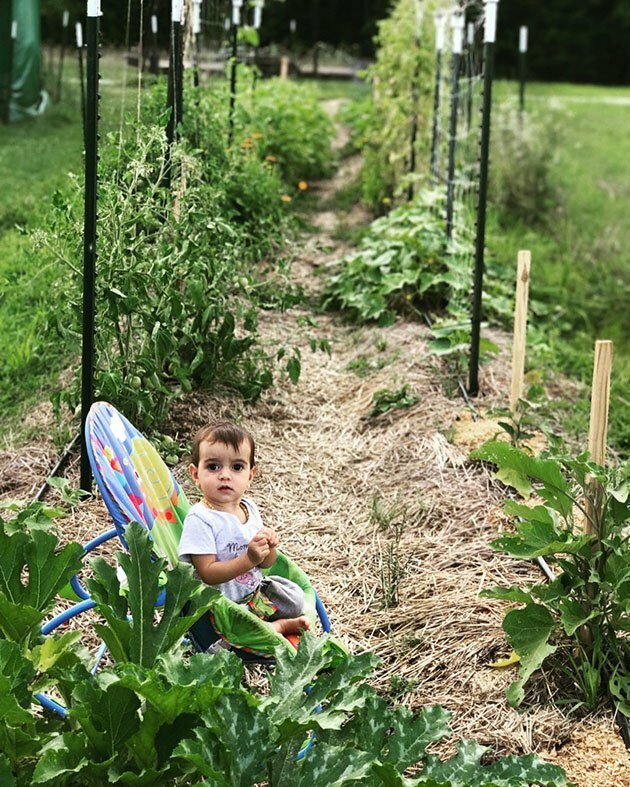 If you have young kids, it might be a good idea to section your garden and give them their own space where they can dig, plant, pull, harvest, plant again, picnic, pretend they are insects, dig some more, get dirty, eat, dig again, and eat some more. A place that you don’t count on for food production, a place where they can have fun and practice without messing your hard work. 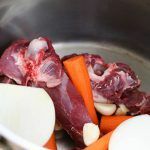 I struggled with this idea for a while because it felt like I was trying to keep my kids away when the whole point of living this homesteading lifestyle is to have them grow closer to me and to the land. But I made peace with the fact that it’s ok for them to know that there is a space we can play in and a space we don’t play in because we rely on it to feed us. I also found that my kids love having their own space where they can make decisions and create something the way they want to. Be Colorful and Pretty – think red, pink, orange, purple vegetables. Kids love colors! It makes them so excited when they pull a purple carrot from the ground. To make the garden prettier, we added a couple of varieties of flowers. You can choose a seed mix and get many colors even for just one kind of flower. 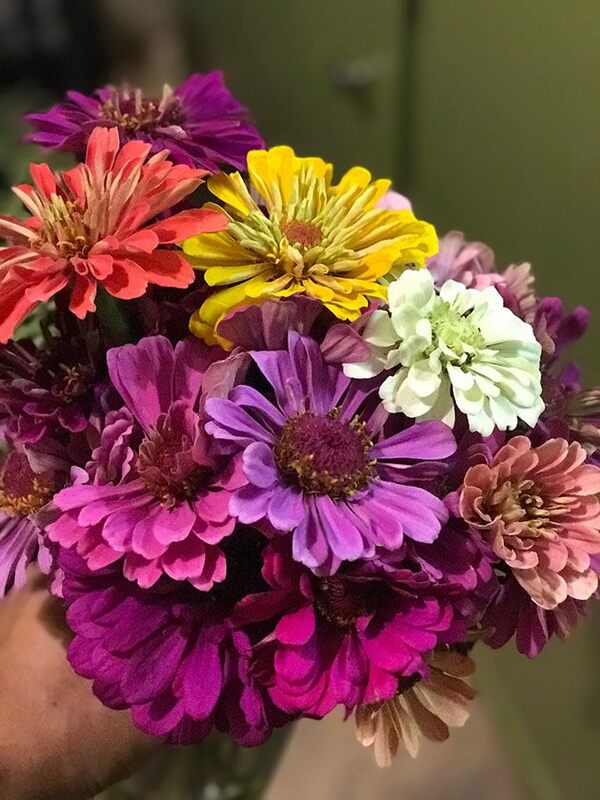 Flowers are not only beautiful and fun for the kids to pick they also attract butterflies and bees which are fascinating for the kids (and their mama) to watch. Include Small Vegetables – we chose small varieties, for example, cherry tomatoes instead of larger verities of tomatoes, small cucumbers instead of the big, full-size ones. I wanted it to be easy for them to pick and eat straight from the garden. A growing snack bar is the main idea here. 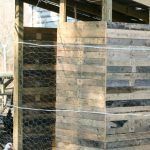 Have Cool Structures – there are so many cool structures that we can build in this garden like a bean teepee or an arched trellis for peas. I am thinking structures that the kids can sit in or play in/with. We will create a picnic area, maybe from hay bales or logs or other natural materials. A fairy garden will also be fun to make. Include Things They Like to Eat – it would be a waste of time to plant okra, they are not going to eat it. We are looking for things they can eat right there in the garden. Zucchini won’t work either, cabbage or onions won’t do. You’ll see below that I mainly include varieties that they can eat right there in the garden. In the main “adult” garden I’ll grow the rest of the stuff. Include Fruits Too – this is a tough one because there aren’t a lot of fruit plants that will give you fruit the first year. But there are a few, like watermelons or cantaloupe or ground cherries. Beans – I had a lot of success with Fortex beans in the past so I am sticking with them. They climb high and are great for a bean teepee and they produce a lot of beans. 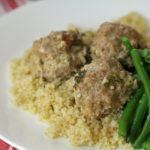 My kids eat beans fresh from the garden, I prefer them steamed with garlic and butter (read: Quick, Easy, and Healthy Fresh Green Bean Recipe). I’ve never grown Red Noodle Beans but I think it will be nice to try them in the kids’ garden. They are so long and cool looking, I think my kids will love them but I’m not sure they are good to eat fresh from the vine. Cucumbers – I am sticking with good old Marketmore cucumbers. I’ve grown them a few times and they’ve never let me down. They are my main crop cucumber variety. Mexican Sour Gherkin is a new variety that I want to try. They are a 1” cucumber that looks like a tiny watermelon but tastes like a cucumber, isn’t that fun? I think any kid will love picking those, hopefully the flavor is good too! We are also going to grow Arkansas Little for pickling. My kids LOVE fermented pickles and I hope that I can ferment enough for the whole year from the summer garden. Cantaloupe – in the past, we had a lot of success with Sarah’s Choice here (pictured above). It is sweet and juicy. This year we are going to try Sugar Cube. Should be just as sweet but a bit smaller. Peas – if there is one veggie I can’t grow enough of is peas. There are daily life-threatening fights in the garden over the peas. We grow Sugar Snap for fresh eating and Little Marvel Dwarf for shelling so they can mess with finding the treasure inside. Peppers – I grow the red Lunchbox peppers from Johnny’s (in the picture is an orange Lunchbox pepper from the mixed Lunchbox seed pack. I find that the red peppers are the sweetest so I grow only them now). They are small, they are beautiful, they are sweet, and the plants produce a lot of peppers. You also don’t have issues like blossom end rot and such, the plant does not require as much from the soil. Radish – Easter Egg radishes are colorful and fun. First, they are beautiful, and second, they are mild. They are also fast growing which is great because kids aren’t the most patient creatures. Cherry Tomatoes – you can get a serious headache when trying to select tomato varieties for your garden. There are so many different tomatoes and they all look so tasty and beautiful. After years of growing tomatoes, I have five favorite varieties. For the kids’ garden, Matt’s Wild tomatoes fit the bill just right. They are tinier than a cherry tomato and there are a ton of them on each vine. The kids pick them and snack on them in the garden and I throw them in a fresh summer salad. 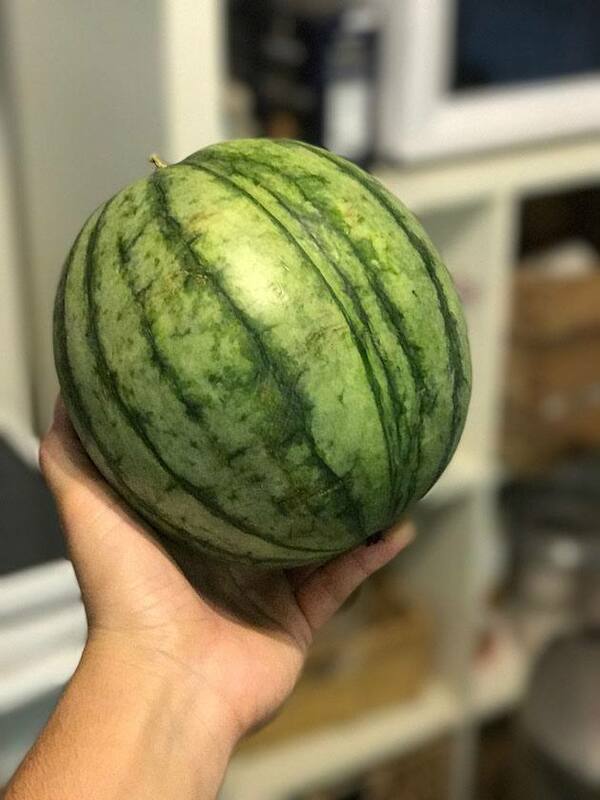 Watermelons – we grow Crimson Sweet watermelon. They are not too big and so very sweet. Ground Cherries – I came across this plant when I was looking for fruit plants that will produce fruit the first year. 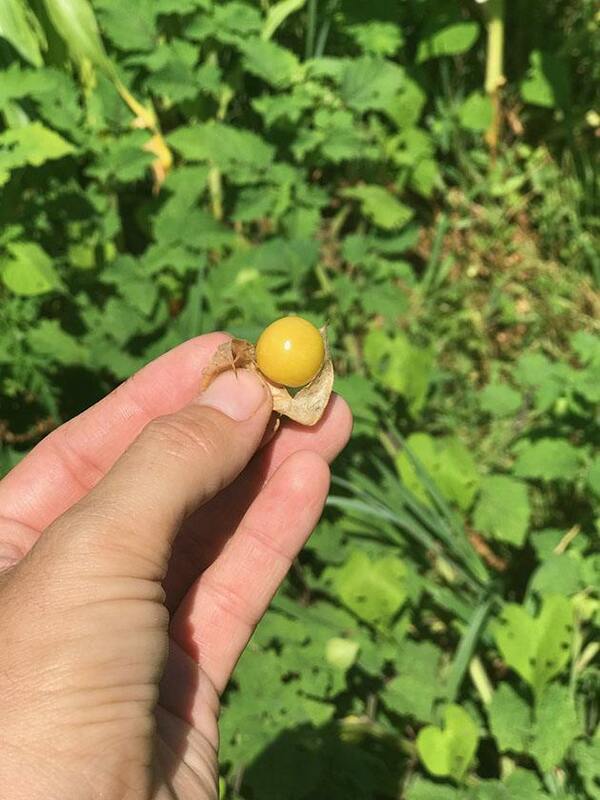 Ground cherries are smaller than cherry tomatoes, they are golden and are sweet and wild tasting with a bit of pineapple flavor. They are so much fun! The seeds are tiny (smaller than carrot seeds!) but they grow into big plants with lots of little, yellow, round, marble-sized fruit that is inside the husk. They are fun to pick and peel (it’s like hunting treasure…) and they are tasty. Marigolds – this year I’ll try Naughty Marietta. They have a strong stem so they will be great as cut flowers, they are annuals, and very beautiful. I am just hoping that the southern summer heat won’t be too much for them. 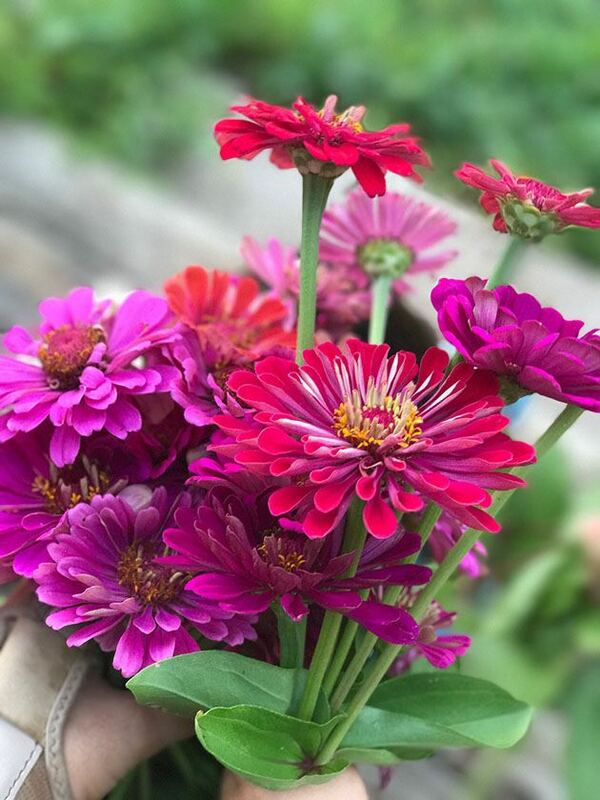 Zinnia – this is the only flower I have experience with (read: How to Grow Zinnias For Your Bees). I have grown zinnias a couple years and have to admit that sometimes they make it hard to concentrate on the vegetables. I’m sticking with Sunbow Mix here. Gourds – I am so excited to try gourds! I think my kids will love this ornamental. Even though it’s not a plant they would eat right there in the garden I wanted to list it here because I can only imagine how wild they will go when I show them how they can GROW birdhouses. This is going to be super cool. I am going to try Brandshaw’s Ornamental. I buy all of my seeds from Johnny’s Selected Seeds and Southern Exposure Seed Exchange. I try to get everything I can from the Seed Exchange because they are much cheaper than Johnny’s but I will gladly pay more for a variety I like from Johnny’s if I can’t find it locally or at the Seed Exchange. Of course, there are many other plants my kids love to grow and help with. One good example is potatoes (read: How to Grow Potatoes and How to Plant Sweet Potatoes), they love digging them out and they even love catching the Colorado potato beetles. But I didn’t include them here because they can’t eat them right in the garden. For this kid-friendly garden, I wanted to choose varieties that they can enjoy right in the garden. The funny thing is that after a couple of years of doing this I find that it’s much easier to grow these small vegetable varieties. 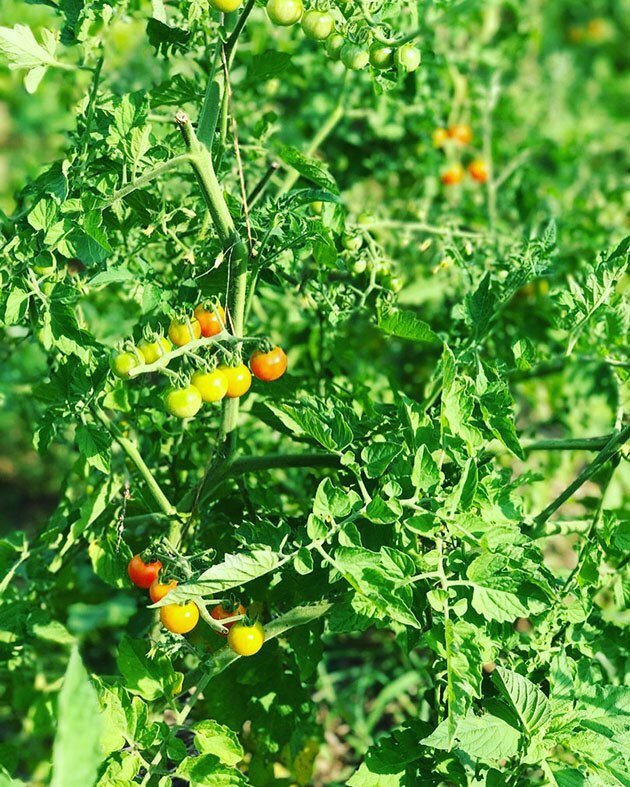 For example, one vine of Matt’s Wild tomatoes can literally produce all the tomatoes I need for fresh eating for all of us for the whole season! There is no blossom end rot, I don’t need to pay attention to pruning, I don’t need to worry about the tomatoes being too heavy for the plant like Cherokee Purples are often… It’s just so much easier to grow these. The same goes for peppers. 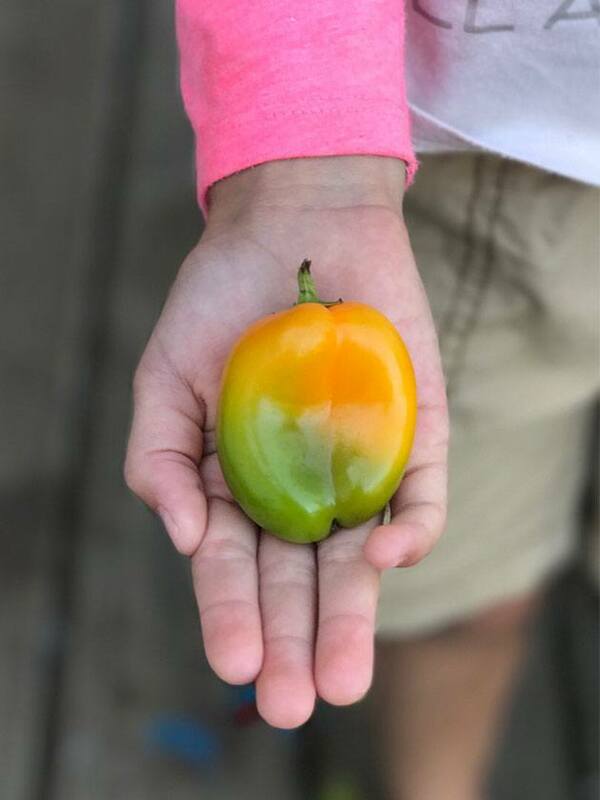 Growing Lunchbox Peppers is so much easier than growing bell peppers. They taste the same but there is no blossom end rot or anything like that. Supporting the plant simply means tying it to a stick. 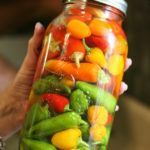 It’s super simple and you get so many peppers from one plant. So this experiment of a kid-friendly garden actually taught me a whole lot. I ended up changing many of the varieties in the main garden to the varieties that I chose for the kids and they became my main varieties. 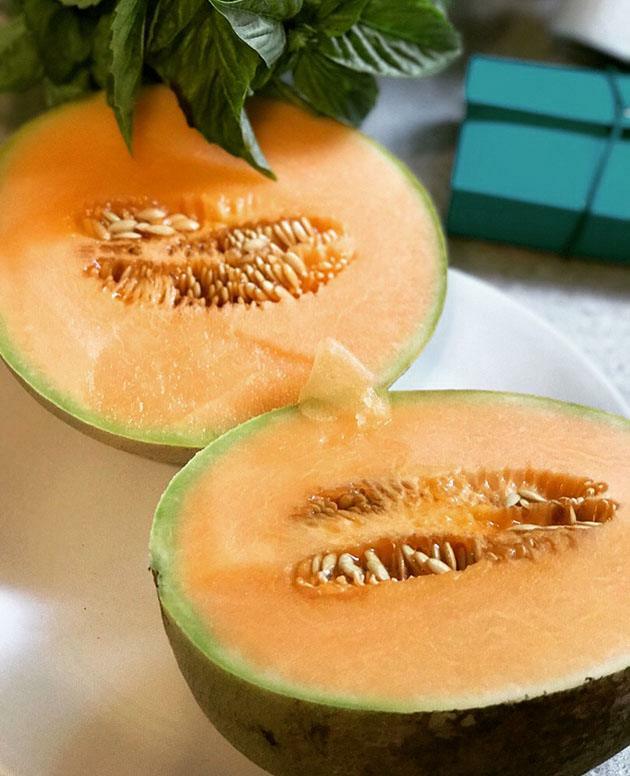 I found that it’s much easier and more productive to grow small cantaloupes, the same with watermelons and many others. Now that I feel like I have my varieties set and I know what I’m doing in that department, I want to concentrate a little bit more on fun structures. Arches, teepees, a sitting area, butterfly houses… It will be so much fun having those around and it will be fun working on those projects with the kids. How do you garden with kids? Do you have a favorite variety to grow for and with the kids? I’d love to hear from you so take a moment to comment below and share your experience! Plant some snow peas of some sort. If you’ve never shucked some of these little gems and eaten then right in the garden, you have lived! They’re like candy, they’re so sweet. They don’t need washing before consuming, either, since they’ve been protected by the pod. Pick them while the peas are small, and you’ll be very surprised at how sweet and tender they are. While you’re pouring over the seed catalogs this winter, pick out a early ripening sweet corn that grows “kid sized”… three to four feet tall. That’s something else they can eat right in the garden, raw, without having to wash it first. Corn can be unbelievably sweet right off the stalk, and actually tastes good raw when it’s that fresh. Some everbearing strawberries could be a way to get them some fruit the first year, and fairly early on. Conventional strawberry wisdom says to pick off the flowers the first year, but I’ve never been able to do that, and still get loads of berries the first year, and more than I can use the second. Great idea for the kid’s garden! LOL, I got you. No worries! I will definitely try the snow peas. I never grew those before. I am sure my kids will love them. I didn’t know you can get “kid size corn”! I never saw anyone grow those. I have to check the catalogs I have here, I don’t remember seeing a short verity. I didn’t choose corn because the size of the plants, but if I can find something smaller than regular corn I will love to include it. We had a 100′ row of corn at the farm last year and it was so sweet raw. I was so excited, we ate as much as we could raw and I put the rest in the freezer. When we took it out of the freezer to eat, it had no taste at all. Very disappointing. I am not sure why this happened. I didn’t include strawberries because everywhere that I read about strawberries it says to pick the flowers the first year. Also, once I plant them it will be hard to move them if I ever need to. Maybe I’ll plant a bed at the farm. – Did you blanch the corn prior to freezing? Makes a big difference. – There are some varieties of corn that grow to a small size. Just look around. They’re out there. – All the “instructions” for growing strawberries say to pull the first year’s flowers, but again, I never have done it. It was too much work! After the first week or so of blooming and trying to pick some off, I just let them do their thing. My strawberry beds (100 plants total) overwhelmed me by the end of the first year with all the runners and new plants, and got completely out of control. I just couldn’t find the time to keep up with them. After picking 40+ pounds the second year (even with a fungus problem that ruined 2/3 of the crop) I killed them all and I’m going to start over in a new spot with a new batch of plants (I decided I didn’t like the June bearing plants, and like everbearers better.) Runners are going to be snipped before they get out of control in the new beds, and I’ll be more ruthless in controlling them. Strawberries can act like weeds if you let them… no need to be overly gentle once they get established. Oh, and be ready with some captan spray early on, about when they bloom, to keep fungus from taking hold. It’s very disappointing when you grab a big ol’ beautiful berry and the back side of it is turning black and mushy, and 3 out of 4 you pick are the same way. 🙁 Fungus. Bad. Strawberries definitely need some maintenance. It’s like mint, it will take over the whole garden before you know it. I think I’ll put them somewhere away from other plants. This way, if I don’t have time to care for them they don’t ruin something else. I looked for small corn in the catalogs I have in the house but I can’t find anything. I’ll keep looking. My neighbor swears by “Peaches & Cream”. I think that’s what I’m going to go with this year. The fancy, dancy super sweet varieties I’ve planted the past few years haven’t been doing so well. His always does much better than mine. I’ll take a look thru my catalogs when I get home tonight. I know I’ve seen some shorter varieties, and I have TONs of seed catalogs. “On-Deck Hybrid” shows to be a 4-5′ variety of sweet corn. It’s pretty early, too, for impatient young gardeners: 61-63 days. It’s bred for containers, but I’m sure it will do fine in the garden. Also in a 2016 catalog, Johnny’s Selected Seeds shows 4 varieties that grow to 5′. Something else that caught my eye you might want to consider was in the 2017 Southern Exposure Seed Exchange catalog (you don’t have to send them seeds to by from them 🙂 ) is a variety called Chires Baby Sweet Corn. It’s the tiny corn you see in Asian food. Sounds pretty versatile. Thanks! I will take a look in Johny’s, I have a few things to order from them anyway. It’s the shortest corn variety I’ve run across so far. I have this catalog. I’ll check it out. Thanks! Your kids are lucky to have a mom that will give them their own wn garden. My mom did the same and it’s one of my favorite memories of growing up. Our well is right next to the garden. We recently built a new well house and I think what we are going to do is build raised beds around it for herbs. This way the herbs will be close to the garden but not in it since some of them and take over the whole space, like mint for example. For the butterflies, I hope the flowers that we choose will bring them in and there are also a lot of insects that love cucumber flowers. I really hope my kids will make nice memories there! I often wonder what will they remember from their childhood. Time will tell. Missouri Wonder beans are great pole beans. Not only do they taste good after being canned, they produce right up to frost. After the second or third picking they slow down but you still have a few right to frost. Basil also might be ok for them. You could put in some kind of mint if it’s to be permanent. I would put it in a container because it spreads so bad. I’ll try Missouri Wonder. Never tried those before. Mint will definitely go in a container, I had it in my last garden and it was so hard to keep it contained. I think I might place it on the porch close to the kitchen since I use it a lot for tea and salad. There are a lot of herbs that are good in a children’s garden since they can take a lot of abuse, err, I mean kid loving 🙂 There are lots of flavors of mint (chocolate, apple, spearmint, peppermint) and not only do the children love them but iced mint tea in the summer is the most refreshing drink I know. It does spread so if you have limited space find a old metal bucket or soup pot or washtub that has holes in the bottom to put it in. Since you are going to use drip, just sink the tub into the ground at the end of one of your drip lines with an emitter in the tub. Oh, and don’t put any of your nice topsoil in there, mint doesn’t like rich soil. As with many herbs, they’ll grow in most any soil as long as it drains well. Lemon balm (a close relative of mint) is another herb that makes a lovely hot or iced tea. It does spread but not like mint. I think some people pot lemon balm but I’ve never found it to be necessary. Calendula is a very useful herb as well as being a pretty flower – sort of a daisy like, yellow/orange flower. I like to use the petals in green salads, they have a mild, pleasant taste but I throw them in because they are so pretty and brighten up the salad. Another edible flower I always have are nasturtiums. You can get climbing ones or ‘bush’ types in all sorts of colors. I always had yarrow in my garden not so much for the flowers (which are certainly pretty) but for the leaves. It’s one of those old, old herbs, used since at least the time of Alexander the Great as a coagulant. The ‘wounds’ my kids got were more like scrapes but if there was even a tiny speck of blood they got the full battlefield dressing! First a bundle of soft yarrow leaves to stop the “bleeding” then one or two lamb’s ears leaves (also soft with mild antiseptic properties) over the yarrow, all of it tied on with a strip of cotton cloth. By the time the bandaging is done they are usually over the injury and anxious to get back to playing. Parsley is another useful plant that my kids used to munch on. And dill – you need it anyway if you are going to make dill pickles with your cucumbers and it makes a great “forest” for the kids. One last thing then I have to stop before this turns into a book! What about a raspberry or blackberry bush? You should be able to get some starts from neighbors and friends. They won’t fruit the first year but I always liked to have the berries within easy reach of the kitchen so you might have a spot where you can put them that isn’t actually in the kids garden. Then you’ll have berries next year and the kids can pick them. I know there are thornless varieties but I’d stick with the regular ones. I never had a child have a problem with the thorns. Usually they saw it as a challenge and would see who could pick the most berries “without one scratch”. I’m glad you are encouraging your children to enjoy ‘gardening’. To learn where their food comes from and that they can grow it themselves is truly a priceless gift. Not far from the kids garden we are going to build a few beds for herbs. This way they will not take over the garden. Yarrow I really want to grow a lot of at the farm and dry. Not sure I can make this happen next year, but it is definitely on my list. I have a small hill in the back yard, I am not sure how it got there… Maybe someone brought a truckload of soil years ago? Not sure. Anyway, there are a few blackberry plants on it and the kids call it Blackberry Hill. It’s really cute. They made a path through the plants and they play there all the time. But the berries didn’t really taste good this summer. They were sour. So I think what I’ll do is fertilize the plants that are there and add a few more next year. Calendula is on my list for the farm! I plan a 100ft of it but I never knew you can eat it in a salad! I thought it was only used dry as a medicinal herb. Thanks for the information!! Thank you for this information. I just ordered several of your suggested seeds above and am excited to begin! Great! I am going to place my order tomorrow. I have everything saved in my cart but was waiting to make sure I didn’t forget anything. I can’t wait for spring!